I don’t think Dan has ever met a coleslaw he doesn’t like! (For those of you new to the blog, Dan is my hubby! 💑) If we are out for dinner I’d put money on him ordering coleslaw whenever it’s available. 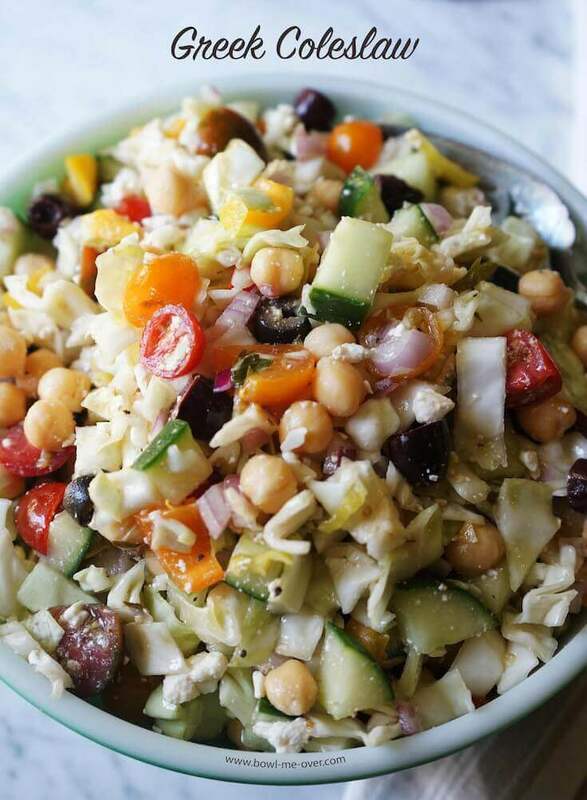 Greek Coleslaw – delicious crunchy vegetables goodness! Am I alone in thinking all coleslaw’s were bathed in mayonnaise? I thought that for the longest time. How about you? But all coleslaws are not alike! Coleslaw can be so much more AND much better for you too! Just look at all of this crunchy goodness! Don’t get me wrong, I do love mayonnaise. But I am finding and appreciating that a fresh bright taste really enhances flavors, rather than covering them up. Got leftover Greek Coleslaw? 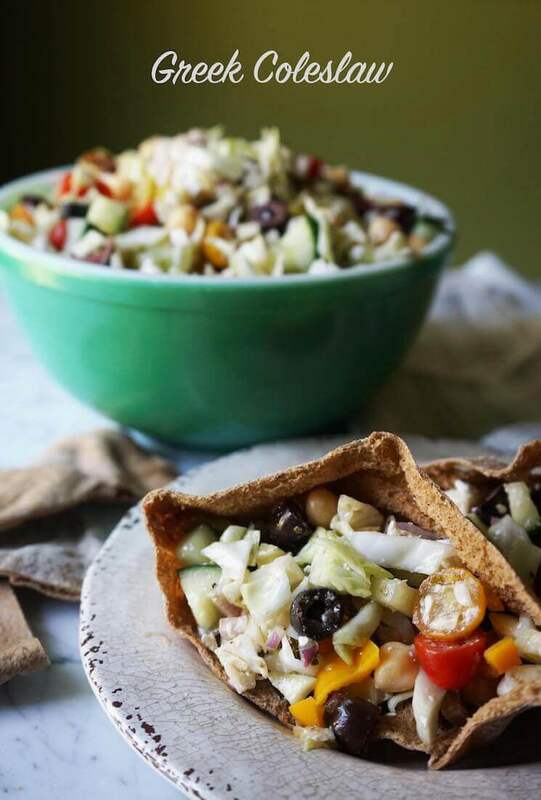 Tuck it into a pita for a deliciously light sandwich! And an added bonus, leftovers make a great sandwich! Greek Coleslaw Sandwich? Yes, I like the sound of that! Makes for an easy light lunch and/or an option for your vegetarian friends too. 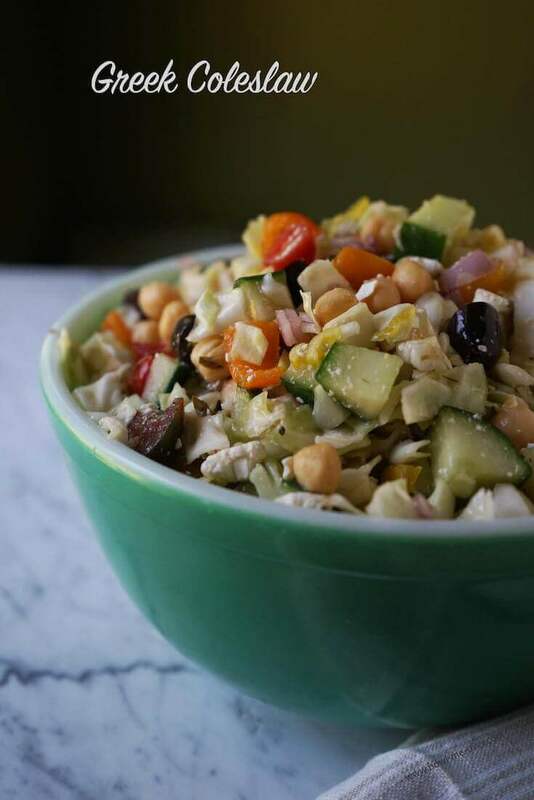 This salad is perfect for a summer barbecue – no mayo! It holds up well in the hot summer temperatures too. Living in Fresno we have plenty of opportunity to test that theory, LOL! 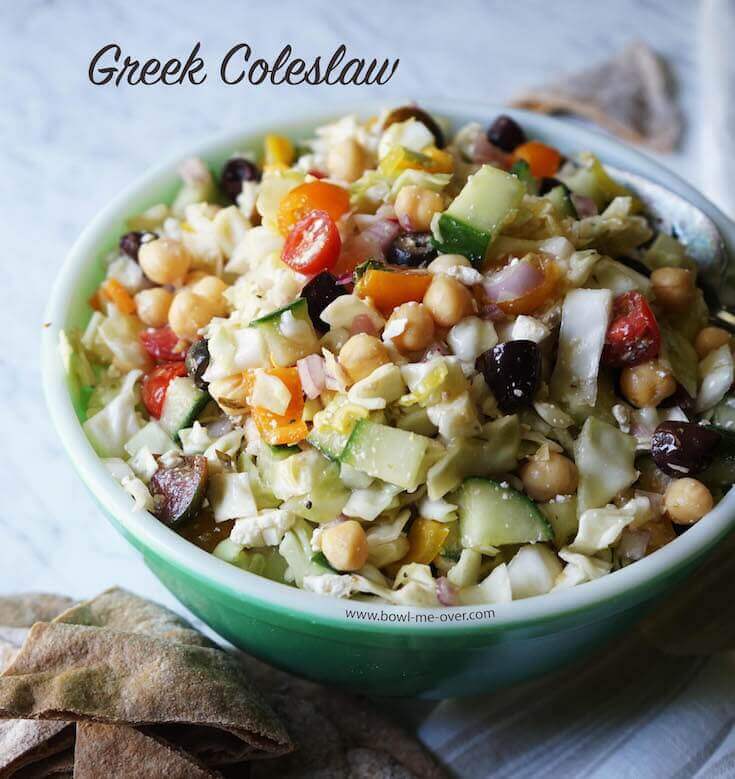 Greek Coleslaw – deliciously crunchy, light and delicious! Easy recipe, no cook, healthy salad option! Want an easy salad for a summertime cookout? 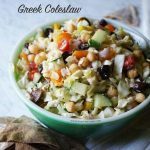 Greek coleslaw is deliciously crunchy and full of big flavor WITHOUT any mayo it's perfect for a bbq! Slice the cabbage in half. Wrap one of the halves and return it to the fridge. Remove the core from the cabbage you're using and also remove any brown outer layers. Chop or shred the cabbage. Add to a large bowl. Prepare the remaining vegetables. Dice the cucumber, slice the olives and cherry tomatoes. Dice the red pepper and onions. Chop the peperoncini. Add all of the chopped vegetables to the bowl and mix well. Add about 1/2 cup Greek vinaigrette mix again. Top with crumbled feta cheese. Serve and enjoy! Don't worry, this is just as crunchy and delicious on day two! The green cabbage stays crunchy and delicious! Wow! This one isn’t only healthy, it looks SO Good!!! And it must be so delicious, too! It’s perfect for Summer and it’s so easy to make! Thanks for recipe, Debra!!! Thanks Liza – this one is so delicious, we’ve been munching on it for a couple of days now and it just keeps getting more delicious – love all that great crunch!! This looks so yummy. Being Greek I too love a great Greek salad and this just sounds so good. Will be trying it for sure. It also looks like a fantastic dish to bring to a pot luck. It’s perfect for a pot luck or cookout Diana and I know you’ll really enjoy it! Thank you for stopping by and for the compliment! Have a fantastic day! !